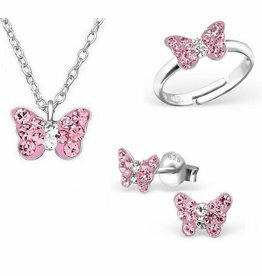 Silver set earrings & ring "pink butterfly"
Home / Silver set earrings & ring "pink butterfly"
♥ The necklace is. 925 silver and has a length of 35 cm. ♥ For a good price because they are packaged as a set together. ♥ Allow extra shine your jewelry with the included silver polishing cloth. The cloth is about 9 by 6 cm and is impregnated with special silver polish. Lief roze vlindertje met kleine kristallen. Gemaakt van door-en-door .925 zilver, voor altijd mooi. Sierlijk verpakt in een roze zijden sieradenbuildeltje, gelijk klaar om cadeau te geven! 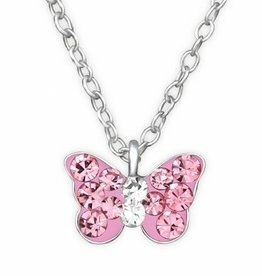 What a wonderful gift for a little princess. 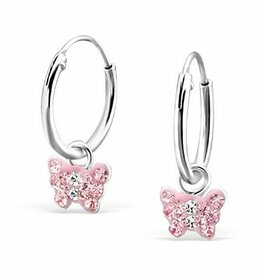 The three-piece set is by-and-by .925 silver and studded with glittering pink stones. Luxury wrapped in a lovely gift box, equally ready to give.